Blue Dragon Film Awards 2018 Best Actor Hwang Jung Min takes the challenging role of a persecutor falsely accused of murder in the film, “A Violent Prosecutor” this April on KBO. Byun Jae Wook (Hwang Jung Min) is known as a dedicated prosecutor who doesn’t play by the book to win cases. But this dedication became his downfall when gets framed for killing a hoodlum shortly after he questioned him. Instead of helping him in his case, his boss Yoo Jong-gil (Lee Sung-min), suddenly cut ties with him and leaves him rotting in the jail. Trying to find a way to get out, he meets Chi-won (Kang Dong-won), a swindler who is an acquaintance of the dead man. After Byun helps Chi-won to secure an acquittal, the two join forces against Yoo who set him up and is now running for office. Don’t miss this blockbuster film this April 27 to 28. Aside from “A Violent Prosecutor,” ABS-CBN TVplus subscribers can catch the 2015 film, “Enemies In-Law,” a romance film about the son of legendary thief falling in love with a police officer. KBO viewers are also in for a treat with loveteam movies headlining this month. Catch back-to back movies of JaDine, “Diary ng Pangit” and “Para sa Hopeless Romantic” this April 13-14. 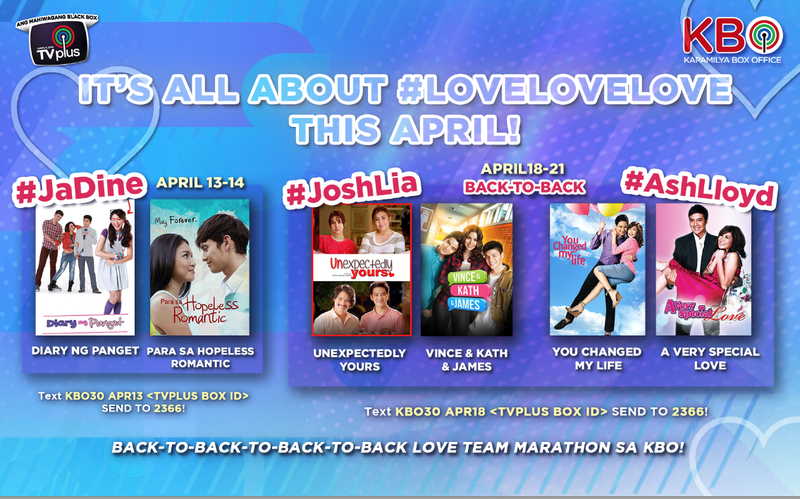 Also watch out for JoshLia’s films, “Unexpectedly Yours” and “Vince, Kath James” plus digitally remastered John Lloyd-Sarah movies, “A Very Special Love” and “You Changed My Life” on April 18 to 21.